The choice of table setting creates a different mood whether it be simple, special or to fit with whatever occasion you have planned. I will give you instructions on how to make a doilie candle holder for a perfect tablescape that you can use during ordinary days and other more intimate occasions too. Step 1 : Prepare all the materials needed. Step 2 : Inflate the balloon depending on the size you desire. 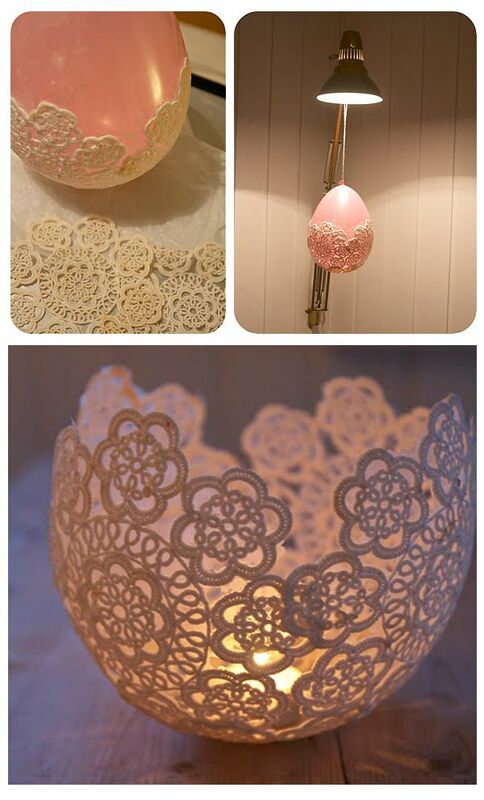 Step 4 : Once doilies are soaked well in the wallpaper glue, carefully stick them on the upper part of the balloon. Step 6 : Tie the nylon string to the knotted bottom part of the balloon and hang it somewhere to dry. You will need at least a day to make it completely dry. Step 7 : Once it is completely dry, use the needle to prick the balloon and gently pull it away from the doilies and voila, your candle holder is done. You can now use it for your tablescape. Note : You can search the internet on how to crochet for beginners and once you are knowledgeable in crocheting, you can search for patterns on how to make a doilie.